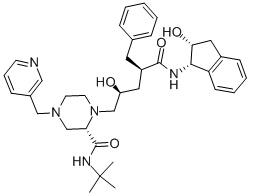 GSK2838232 is a novel human immune virus (HIV) maturation inhibitor being developed for the treatment of chronic HIV infection. 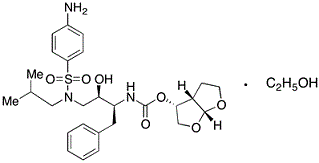 Amprenavir is an HIV protease inhibitor with IC50 of 14.6 ng/mL in wild-type HIV isolates. Darunavir HIV-1 antiviral structurally is similar to amprenavir and it is second generation HIV-1-protease inhibitor. Darunavir Ethanolate is an HIV protease inhibitor. 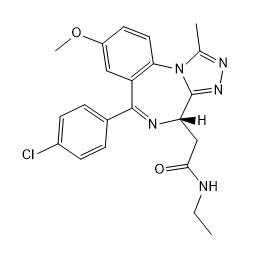 Indinavir(MK-639; L735524) is a potent and specific HIV protease inhibitor that appears to have good oral bioavailability. Indinavir sulfate(MK-639 sulfate; L735524 sulfate ) is a potent and specific HIV protease inhibitor that appears to have good oral bioavailability. GW433908 is a phosphate ester prodrug of the antiretroviral protease inhibitor amprenavir, with improved solubility over the parent molecule and a potential for reduced pill burden on current dosing regimens. 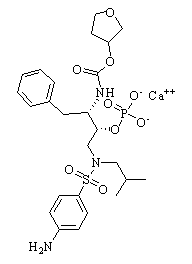 GW433908G is the calcium salt of the prodrug. 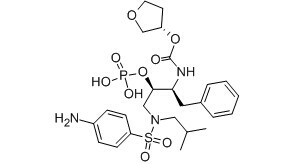 GW433908 is a phosphate ester prodrug of the antiretroviral protease inhibitor amprenavir, with improved solubility over the parent molecule and a potential for reduced pill burden on current dosing regimens. 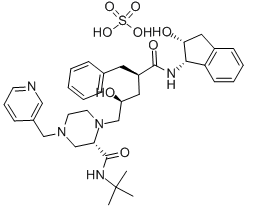 Saquinavir mesylate (Invirase; Ro 31-8959/003) is an inhibitor of human immunodeficiency virus (HIV) protease (Ki values are <0.1 and 0.12 nM for HIV-2 and HIV-1 protease respectively).